The most renowned figure in the world of marketing offers the new rules to the game for marketing professionals and business leaders alike. In Marketing Insights from A to Z, Philip Kotler, one of the undisputed fathers of modern marketing, redefines marketing's fundamental concepts from A to Z, highlighting how business has changed and how marketing must change with it. He predicts that over the next decade marketing techniques will require a complete overhaul. Furthermore, the future of marketing is in company-wide marketing initiatives, not in a reliance on a single marketing department. This concise, stimulating book relays fundamental ideas fast for busy executives and marketing professionals. 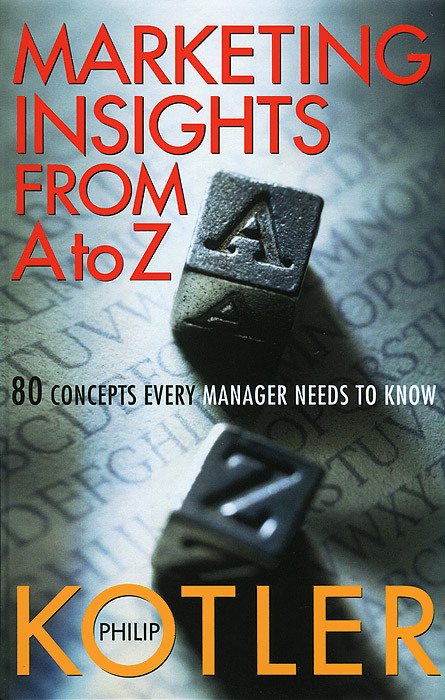 Marketing Insights from A to Z presents the enlightened and well-informed musings of a true master of the art of marketing based on his distinguished forty-year career in the business. Other topics include branding, experiential advertising, customer relationship management, leadership, marketing ethics, positioning, recession marketing, technology, overall strategy, and much more. Philip Kotler (Chicago, IL) is the father of modern marketing and the S. C. Johnson and Son Distinguished Professor of International Marketing at Northwestern University's Kellogg Graduate School of Management, one of the definitive marketing programs in the world. Kotler is the author of twenty books and a consultant to nonprofit organizations and leading corporations such as IBM, General Electric, Bank of America, and AT&T.